A specially formulated bag and block salt with calcium iodate to help promote proper thyroid gland activity, which helps produce the necessary levels of thyroid hormones for optimum performance. Iodine deficiencies in livestock can lead to goiter (an enlargement of the thyroid gland), a condition most often found in young animals. 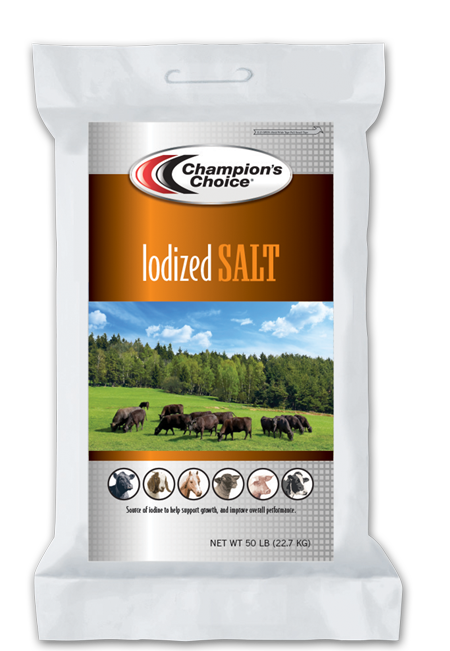 This salt product is intended for beef cattle, dairy cows, horses, goats, pigs and sheep. 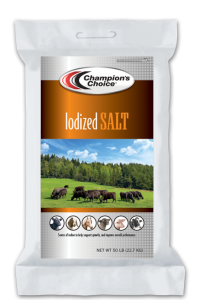 Iodized salt blocks are weather resistant for free choice feeding. Salt, Calcium Carbonate, Mineral Oil, Iron Oxide, Calcium Iodate. How does sodium deprivation occur in animals? When one or more of these conditions exist continuously for long periods and extra salt is not provided, sodium deprivation is inevitable. What are the symptoms of iodine mineral deficiency in animals? What are the symptoms of salt deficiency in animals? Unusual eating habits like consuming dirt or chewing on tool handles, trees, board fences or another animal’s mane or tail. In poultry, an increase in pecking behavior, feather eating, general flock nervousness, and/or reduced egg production. © 2019 Cargill, Inc. All rights reserved.